S R Performance Automotive was established in May 1983 By Steve Rosenfels. 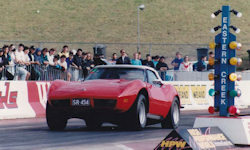 Steve first became involved with cars in 1968 when he enrolled in an apprenticeship. After finishing his apprenticeship in 1972 he was employed by British Continental Cars and acquired a thorough knowledge of fuel injection racing systems, overdrive transmissions, automatic gearbox's, differentials, power steering and advanced auto electrical. Steve loves, works with and owns muscle cars. He has a distinct passion for restoring and rebuilding muscle cars as well as vast experience in BMW, Volvo, Mercedes, and Fiat motor vehicles. Steve maintains that without this passion he would be just another mechanic. Peter Srbinovski has worked for SR Performance Automotive for over 20 years and has known Steve professionally for over 30 years. A Ford expert with vast experience on motor vehicles from Corvettes to Volkswagen, Peter's passion and experience spans all models of Corvettes and this experience adds great value to SR Performance's specialty in building & restoring Corvettes and other muscle cars. Peter's mechanical & engineering skills, including fabrication and machining, are an excellent combination and continue to provide our customers with the highest level of quality and expertise. Stephen Sharkey joined SR Performance in 2007, injecting some youth and extra passion into the team. His thirst for knowledge and drive for excellence is what led him to seek out a specialty workshop that would allow him to further his mechanical expertise whilst working on cars he loved. Absorbing everything Peter and Steve have had to teach him, Stephen's knowledge and passion is constantly growing. With training through VCM for specialised computer tuning Stephen is a great asset in the SR workshop. His loyalty to SR Performance and their customers will continue for years to come. In 2015 SR Performance moved to a bigger workshop at 15 Argyle Street, Arncliffe. The bigger workshop sees the SR team able to expand and grow, continuing their passion of restoration of muscle cars and their high level service and mechanical work. With the move to a bigger workshop SR Performance brought in Oscar Hartmann. Oscar is a driven mechanic who constantly reminds anyone who asks he is "living the dream" working at SR. Oscar's friendly personality and constantly growing mechanical skills and knowledge is providing the SR team with another passionate and skilled mechanic whose love of performance vehicles will continue for years to come.